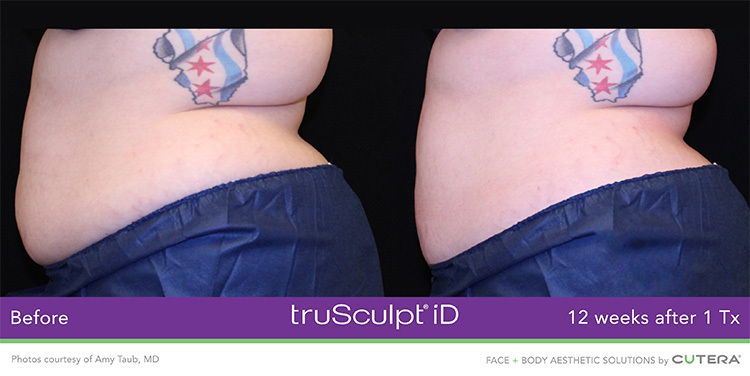 Best truSculpt iD® Services near St Clair Shores MI to Help You Reduce Unwanted Fat! 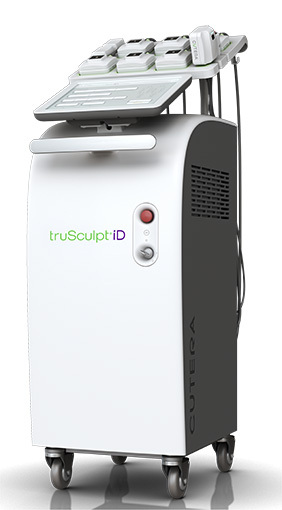 Body Sculpting Spa is excited to offer truSculpt iD (formerly known as truSculpt 3D), a revolutionary non-surgical and non-invasive, body-sculpting treatment that allows you to target your ideal body as quickly as one 15-minute session. truSculpt iD® is a safe and efficient technology that is clinically proven to permanently remove fat cells in stubborn areas like the abdomen, flanks (love handles), arms, chin, thighs, and other specialized areas that have been resistant to diet and exercise. How Does truSculpt iD® Work? truSculpt iD (also known as truSculpt 3D, and truSculpt) provides an effective RF technology that consistently delivers clinically proven results. 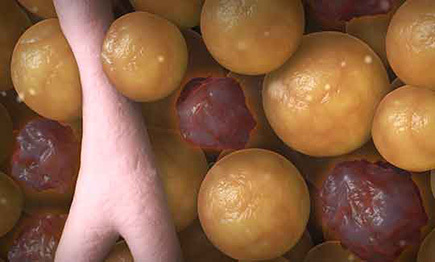 The system versatility allows for customized fat reduction to multiple body sections simultaneously based on patients needs. This revolutionary fat elimination treatment is the newest body sculpting solution available today. Our equipment provides real-time temperature management for clinically proven results, safety, and customer experience. 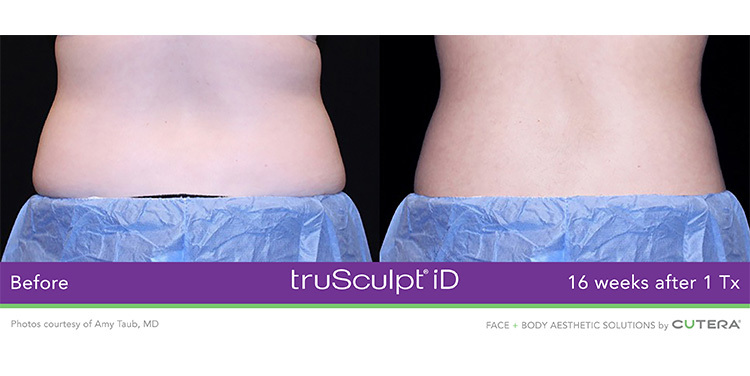 truSculpt iD treats the entire fat layer, which results in an average of 24% fat reduction (2). Call us today and learn why Body Sculpting Spa located near St Clair Shores, is your best choice for truSculpt iD treatments! Why is Body Sculpting Effective? Contact an Experienced truSculpt iD Professional Today! Don’t forget to ask about $400 Off your treatment! Can truSculpt® iD be used on any skin types? Most definitely, this treatment can be done on any skin types & also over tattoos. Post-procedure, the treatment area usually is warm and flushed for less than an hour. Sometimes you could experience minor sensitivity to the touch for a couple days, you will be able to immediately resume normal activities and your active lifestyle. This procedure is versatile & effective in treating a wide range of patients who may not be a candidate for other contouring procedures. Since truSculpt iD is a custom treatment to meet individual needs, most adult men and women should be candidates but are encouraged to schedule a free & no-obligation consult to determine candidacy and pricing. If you live in St Clair Shores Michigan, then contact our office nearby to schedule your consultation with one of our Body Sculpting specialists today! The treatment has minimal discomfort & is similar to a hot stone massage. The treatment duration is based on the treatment size and the number of areas are treated. As an example, treatment time can be 15 – 30 min to treat the flanks & abdomen. Typically, one treatment is required. Maximum results are experienced after 12 weeks. More treatments may be preformed to achieve the personalized results you desire. When comparing to CoolSculpting, CoolSculpting is also an FDA-cleared non-invasive treatment that eliminates fat in the opposite way. 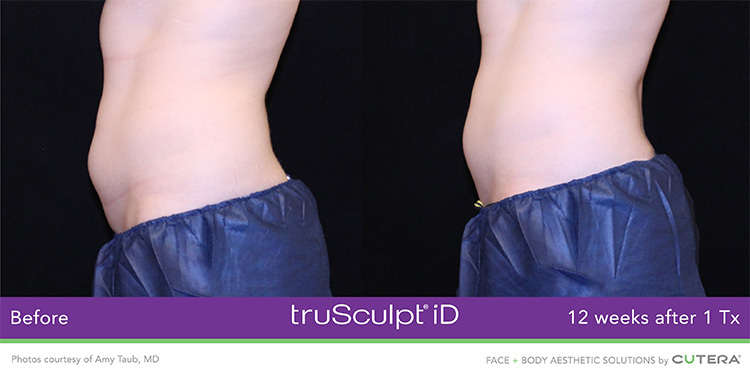 truSculpt uses heat, CoolSculpting makes use of cold temp to eliminate fatty tissues with a clamp applicator. There are some limits to CoolSculpting though, as the clamp applicator must have patients to possess enough bulge to squeeze. 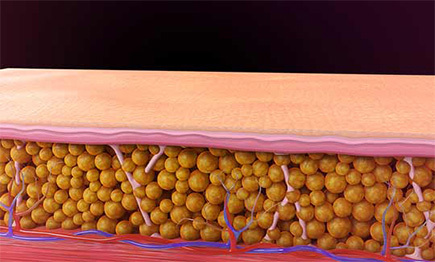 Can truSculpt® iD be combined with other treatments? Yes. truSculpt® iD may be used in combination with other non-surgical methods such as ThermiSmooth and CoolSculpting to obtain a full body shaping and contoured transformation. 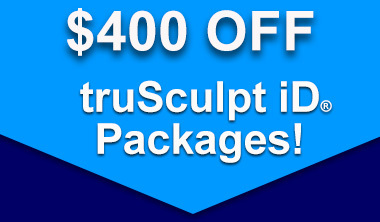 How Much Does truSculpt® iD Cost? Because treatments are specialized to fit the clients needs and goals, pricing is determent on a client-by-client basis. During a consultation the number of cycles best suited for your results will be discussed with you by our truSculpt Specialist as well as treatment pricing and financing. 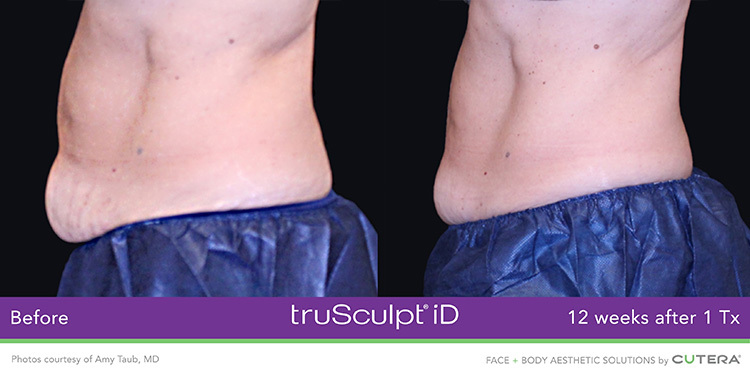 If you would like to learn more about TruSculpt iD at Body Sculpting Spa, please get in touch with us to schedule a free consultation. Of course, if you still have questions, we are happy to help you get the answers you need any time. 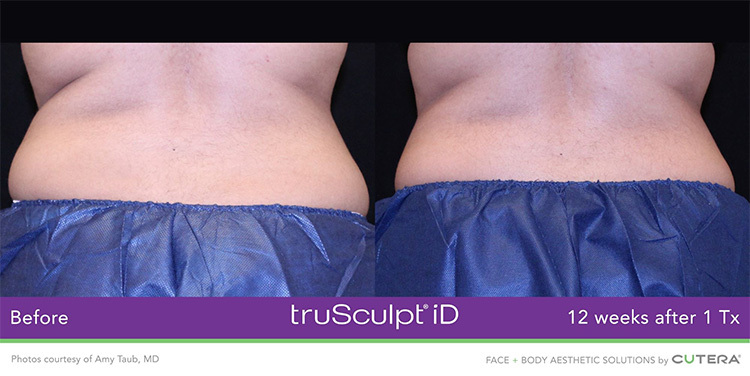 Am I a candidate for TruSculpt® 3D Body Sculpting & TruSculpt® iD Skin Tightening Treatment? 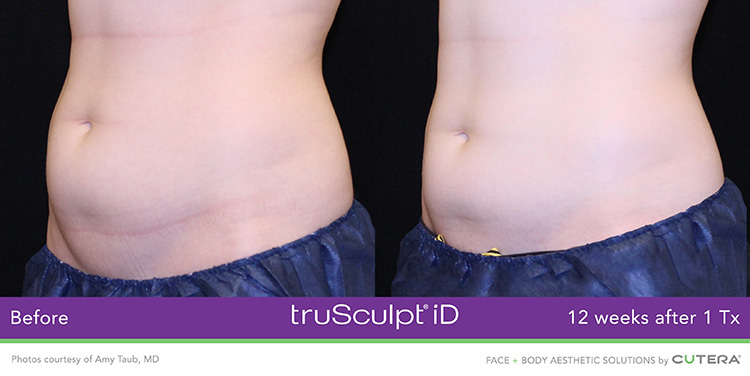 We will determine whether you are a candidate for TruSculpt® iD during your one on one personal body assessment. Typically, appropriate patients have a BMI less than 30, however most people are candidates for this procedure depending on the desired area of treatment and goals they are trying to achieve. People typically see results after one treatment. But with any fat reduction procedure it ultimately depends on the amount of fatty tissue in the area to be treated, also the personal goals of the client. Some people may elect to have a second treatment for final tweaks or for treatments on alternate areas. 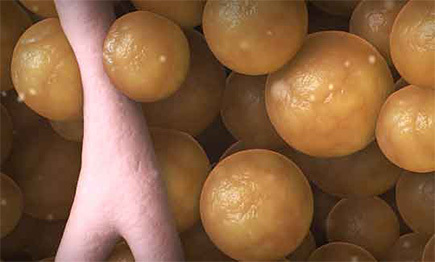 Can I return to normal activities after TruSculpt® iD? Yes, this is a noninvasive procedure and you can return to all normal activities immediately after the treatment with no restrictions. Can TruSculpt® iD be used on all skin types? When will I see results after TruSculpt® iD? 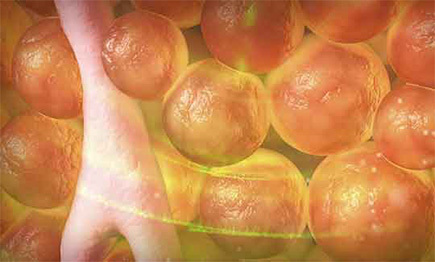 After the treatment, your body’s immune system will start to break down and flush out the fat cells that were treated leading to circumferential reduction. Everyone’s body does so at a different rate however, on average, people will see results for fat reduction around 6-8 weeks after the treatment and continuing improvement up to 3 months. Is there any downtime or side effects after TruSculpt®? There is no downtime or serious side effects after this treatment. We do recommend refraining from going into a hot tub or sauna for 24hrs after treatment due to the treatment area may be sensitive to the heat. The treatment area may or may not feel tender following the treatment but this will resolve within a few days. On very rare occasions some clients feel little nodules in the treatment area, those will subside with a few minutes of a manual massage and/or warm compress daily until gone. What can I expect during the Trusculpt® treatment? TruSculpt® iD is comfortable and requires no anesthetic. 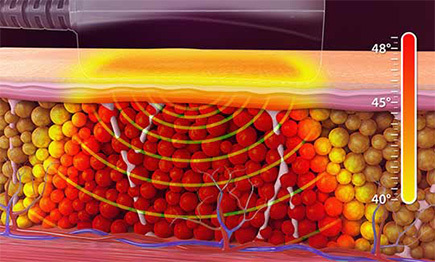 During your treatment, a hand piece that emits radiofrequency energy is placed over the targeted area. Once the cycle begins you will feel increases of heat in the targeted area. Most people report it feels like a hot stone massage and is tolerable, comfortable and relaxing. How long does the TruSculpt® iD treatment take? 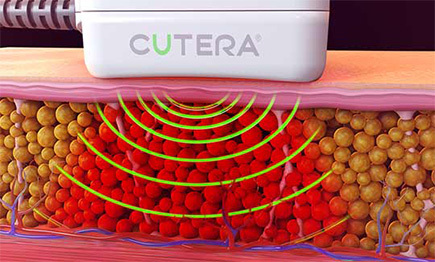 Treatment time depends on the location of the area to be treated and how many areas desired to be treated. To treat an abdomen and both flanks (2-3 areas) will take anywhere from 30 minutes to an hour with set up. Treatment cycles are only 15mins long. This is why we call it the lunch time fat blaster! Service Areas Include: Grosse Pointe MI, St. Clair Shores MI, Clinton Township MI, Sterling Heights MI, Harrison Township MI, Grosse Pointe Farms MI, Macomb MI, Warren MI, Southfield MI, Royal Oak MI, Troy MI, Grosse Pointe Woods MI, Eastpointe MI, Roseville MI, Grosse Pointe Shores MI, and Beyond!